Agriculture and Agri-Food Canada (AAFC) and Environment and Climate Change Canada (ECCC) have been working together to study the potential of trajectories for monitoring insect movements since the late 1990s. Trajectory models are used to deliver an early-warning system for the origin and destination of migratory invasive species, such as diamondback moth. In addition, plant pathologists have shown that trajectories can assist with the prediction of plant disease infestations and are also beginning to utilize these same data. We receive two types of model output from ECCC: reverse trajectories and forward trajectories. ‘Reverse trajectories’ (RT) refer to air currents that are tracked back in time from specified Canadian locations over a five-day period prior to their arrival date. Of particular interest are those trajectories that, prior to their arrival in Canada, originated over northwestern and southern USA and Mexico, anywhere diamondback moth populations overwinter and adults are actively migrating. 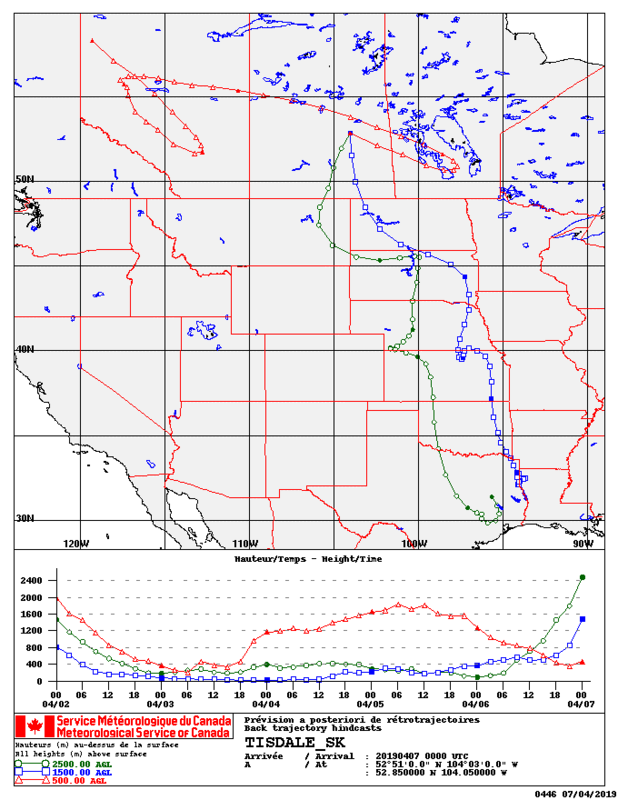 If diamondback adults are present in the air currents that originate from these southern locations, the moths may be deposited on the Prairies at sites along the trajectory, depending on the local weather conditions at the time that the trajectories pass over our area (e.g. rain showers, etc.). Reverse trajectories are the best available estimate of the ''true'' 3D wind fields at a specific point. 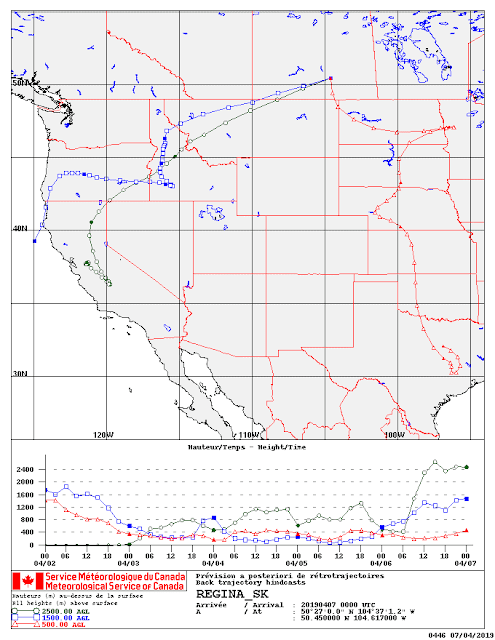 They are based on observations, satellite and radiosonde data. ‘Forward trajectories’ (FT) have a similar purpose; however, the modelling process begins at sites in USA & Mexico. The model output predicts the pathway of a trajectory. Again, of interest to us are the winds that eventually end up passing over the Prairies. 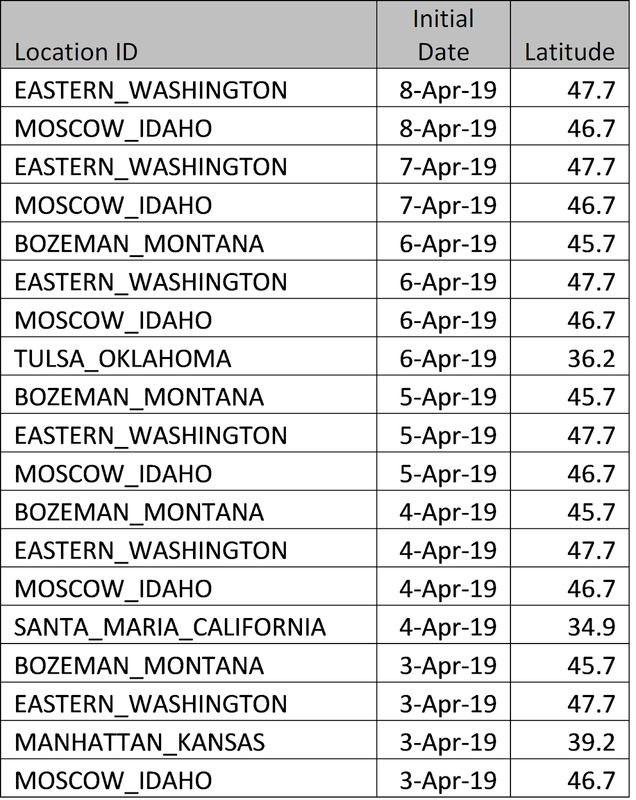 a. Pacific Northwest (PNW) – For the period of April 2-8 there have been 69 RT’s (originating over the PNW) that have crossed over prairie locations. 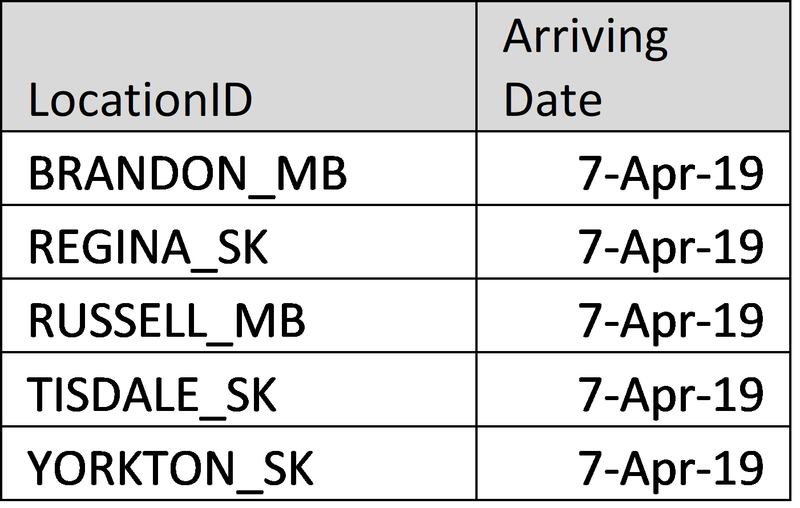 Since March 23rd Lethbridge has reported the highest number of PNW RT’s (n=9), followed by Olds AB, Beiseker AB and Dauphin MB (n=6). 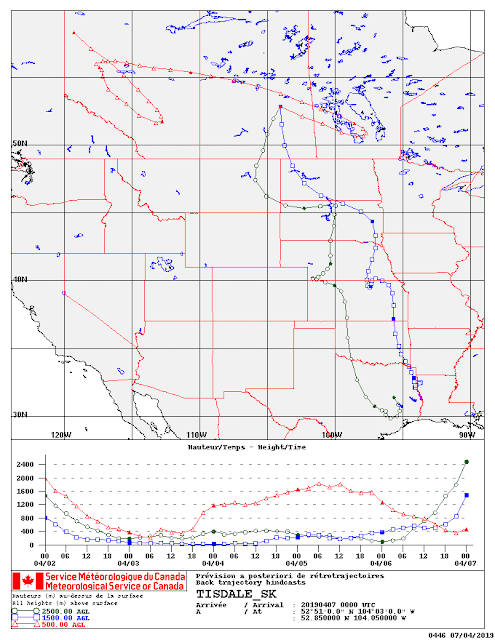 b. Mexico and SW USA (SW) – On April 7 the first Southwestern USA and Mexico RT’s crossed the prairies. These reverse trajectories originated over TX and CA. 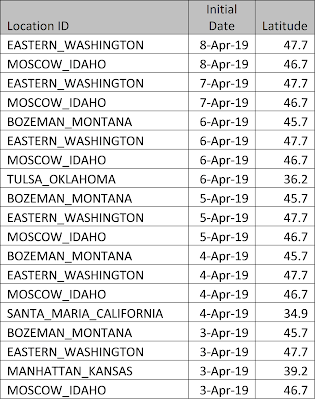 The following maps present two examples of April 7, 2019 RT’s. The first map indicates that the RT crossing Tisdale originated across southern TX. The second map shows that two RT’s crossed over Regina. The red line indicates that this RT originated over southern TX. A second RT originated across central CA. 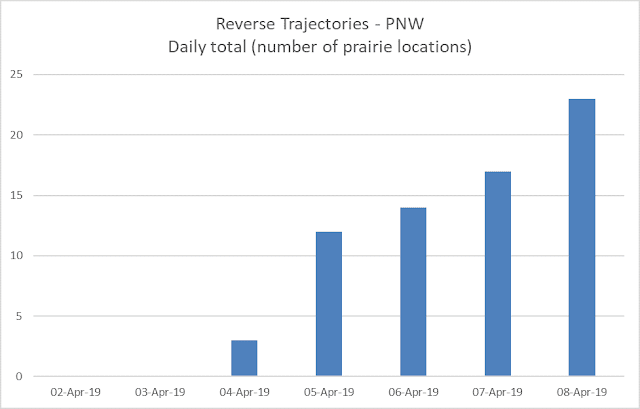 The following table reports the origin of forward trajectories predicted to cross the prairies over the next five days. Forward trajectories, originating over Santa Maria, CA are predicted to pass over SK and MB in the next five days.